Skillet Lasagna with Vegetables is the weeknight answer to your lasagna cravings. Simple to make, packed with veggies, and all the lasagna flavor you are looking for in under thirty minutes. 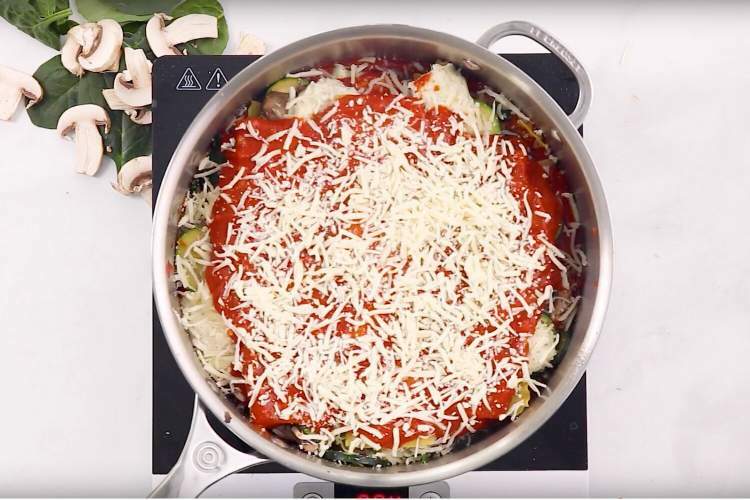 This easy Skillet Lasagna with spinach, zucchini, mushrooms takes less than thirty minutes to make and has all the amazing flavors of baked lasagna. It’s a favorite lasagna shortcut along with this Slow Cooker Lasagna Soup and Spaghetti Squash Lasagna Boats. Love lasagna but don’t love how long it takes? Consider making this skillet vegetable lasagna instead. It has all the great flavor of lasagna but is made in one skillet on the stove without all the prep. It’s the lasagna recipe you need for busy weeknight meals. Let’s talk about why this skillet lasagna recipe works for well. To keep things healthy, it starts with veggies. I used zucchini, spinach, and mushrooms but you could use any combination of veggies you like. You could also add some lean ground turkey, ground beef, or turkey sausage if prefer meat lasagna. Next up is the tomato sauce. You can use a simple canned tomato sauce or reach for your favorite brand of pasta sauce. Both will work great. Next up is the key to any good lasagna – the ricotta cheese. It’s seasoned with plenty of herbs and Parmesan cheese so that every bite is packed with flavor. And then to keep things super easy, this recipe uses no-boil lasagna noodles. You can use regular no-boil lasagna noodles or whole wheat for a healthier spin. Then all you do is layer everything into your skillet, cover it, and walk away. In just 25 minutes, you will have delicious lasagna that your family will gobble up. This is a meal your family will request over and over again. Make it spicy: Add some by adding red pepper flakes to the mix. You can also add some sliced Calabrian chiles for heat. Make it creamy: For a super creamy lasagna, grab some cream cheese. Microwave it until it is slightly melted and stir it right into the tomato sauce. This creates a super creamy and rich sauce that is surprisingly light if you use reduced fat cream cheese. Try cottage cheese: Some people prefer cottage cheese in their lasagna instead of ricotta. You can easily swap in cottage cheese for the ricotta. Try different veggies: This veggie skillet lasagna will work with almost any vegetable you like. Some of our favorites include butternut squash, kale, cauliflower, and even cabbage is pretty delicious. Just make sure to cook them first and remove any excess moisture so that the lasagna doesn’t get watery. Add protein: If you prefer a skillet lasagna with meat, you can easily add it to this recipe. Simply brown some ground beef or turkey and create a layer of meat on top of the veggies. You could also use sliced chicken or turkey sausage, just make sure to cook it first if it doesn’t come precooked. To make sure the lasagna doesn’t get watery, make sure to drain the vegetables and squeeze out any moisture. Spinach, zucchini, and mushrooms all release a lot of water when they are cooked and you don’t want that to water down the lasagna. If you like a crispy top to your lasagna, you can place the lasagna under the broiler for a few minutes to create that toasty top that so many people love. This recipe will work with almost any type of pasta in place of the lasagna noodles. However, you will need to cook them slightly beforehand. I find that cooking them for about half the cooking time called for works well. If you don’t care about having the classic lasagna layers, you can break the lasagna noodles into smaller pieces and just loosely layer, stir things together. It won’t be pretty but it will still taste delicious. Can I make this with bowtie pasta? Sure! If you want to make this with bowtie pasta, you have two options. The first is to cook the pasta until is very al dente (about half the cooking time) and layer it in as you would with the lasagna noodles. The second option is to cook the bowtie pasta until al dente. Then stir it into the veggies and marinara sauce. Add the ricotta mixture and mozzarella cheese on top (instead of creating layers) and cover and cook for 3-5 minutes until the ricotta cheese mixture melts and bubbles. Can this be prepped in advance? Frozen? You can prep this skillet vegetable lasagna ahead of time. Simply layer everything together in your skillet and cover with foil. Then when you are ready to cook it, place it on the stove and bring it to a simmer. Once it is simmering, cover and cook for 25 minutes. If you want to prep this in advance to freeze, prepare it in an oven-safe baking dish. Then simply bake at 375 degrees for 35-45 minutes until the sides are bubbling and everything is cooked through. Can I add sausage or ground beef? Skillet lasagna is delicious with ground sausage, beef, or turkey. Simply brown the meat beforehand and drain off any excess fat. Then create a meat layer while building the lasagna layers in the pan. You could also use precooked chicken sausage, cooked chicken breast, or shredded rotisserie chicken for an option that doesn’t have to be cooked.